Art Therapy Research is a clear and intuitive guide for educators, students, and practitioners on the procedures for conducting art therapy research. Presented using a balanced view of paradigms that reflect the pluralism of art therapy research, this exciting new resource offers clarity while maintaining the complexity of research approaches and considering the various epistemologies and their associated methods. This text brings research to life through the inclusion of sample experientials in every chapter and student worksheets, as well as a full chapter on report writing that includes a completed sample report. This comprehensive guide is essential reading for educators looking to further the application of learning outcomes such as teamwork, communication, and critical thinking in their practice. Donna J. Betts, PhD, ATR-BC, is the Clinical Research Advisor for Creative Forces™: NEA Military Healing Arts Network, an initiative of the National Endowment for the Arts in partnership with the U.S. Departments of Defense and Veterans Affairs and state and local arts agencies with administrative support provided by Americans for the Arts. Dr. Betts is an adjunct Associate Professor at the George Washington University Graduate Art Therapy Program. From 2015-2017 she was President of the American Art Therapy Association and presently serves on the Research Committee. An award-winning scholar, Dr. Betts has presented internationally on art therapy practice, policy, and research. Sarah P. Deaver, PhD, ATR-BC, HLM, is in private practice at The Psychotherapy Center in Norfolk, VA. She was appointed to the faculty of the Graduate Art Therapy and Counseling Program at Eastern Virginia Medical School in 1981, was its Research Director from 1996-2017, and was Professor from 2012-2018. Her clinical and research interests include assessment, visual journaling, and trauma informed art therapy. Dr. Deaver has been active in the American Art Therapy Association (AATA) in numerous capacities and was its President from 2013-2015. In 2014, the AATA recognized her as Distinguished Educator, and she was granted Honorary Life Membership in 2017. "Philosophical, theoretical, and practical, this book is a complete guide to art therapy research. Beautifully written, and thoughtfully conceived, the text is ultimately readable and uses art therapy studies to illuminate difficult concepts. It is complete with worksheets providing maps for developing and implementing studies. A must for art therapists wishing to understand research and for those desiring to embark on a research journey." 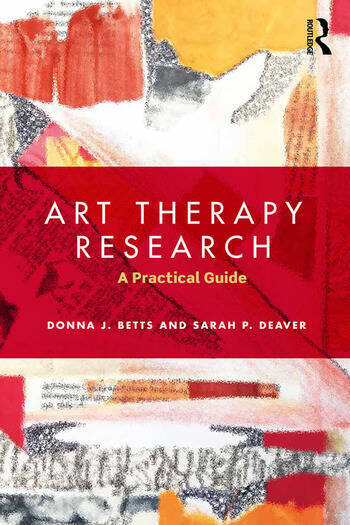 "Betts and Deaver have put together a thorough compendium that illuminates how practice informs research and education in an ongoing feedback loop of expansion that highlights a range of research applications most useful for art therapists. The authors of this text provide a methodologically sound vision for how to understand, conceptualize and apply research paradigms within a contemporary art therapy framework that is focused in scope yet covers the breadth of inquiry that the profession is capable of." "This is a timely, pragmatic, and comprehensive textbook that presents a contemporary analysis of current trends and challenges and a how-to guide on conducting research in art therapy using a range of recognized research methodologies. The textbook aligns assessments, qualitative, quantitative, arts-based and mixed methods designs with a much-needed call for rigorous research in art therapy. The authors are experienced educators and researchers and this is evident in the data collection resources, up-to-date ethical guidelines, recommendations, and reflections on the current needs for methodologically sound research in the field. I highly recommend this text for art therapy clinicians and researchers at all levels of practice." "This is a must-read book for art therapists considering undertaking research studies or teaching research to students. It is a succinct and comprehensive overview of the issues involved with examples from art therapy research and clarifies those crucial practical steps needed to succeed in research."